I may be posting in the wrong place and if I am I apologize. I'm a grandma with a Winter Village that lured me into Lego. I had it at work as a kids therapist for 2 years but it outgrew my office and has a spot at home now. Lots of children play with it from Thanksgiving to New Years. They run the trains, and build their families out of minifigs so it is more strong than elegant. and went a little nuts on bricklink buying what I thought I might need. Last year I copied the seats from twigman's non operational warming hut. Then I stayed intimidated and did nothing until last week. I copied the Friends ski lift which is pretty worthless for what I want and then I built an ugly fortress. Then I went online and learned as much as I could about how real ski lifts work. I bought Sariel's book and built a better tower that doesn't pop off the hill as easily. I finally uploaded my first pix ever to flickr hoping someone here can help me. I tried twine, drapery cord, and yarn to drive my bullwheels but all are too slippery and if I tighten them I collapse my towers. Also my motor needs to be geared down but I'm not understanding enough. I let kids crash trains but I want this to work well before they get their hands on the remote. There is a local LUG but I have to Take care of my Dad on the weekend it meets. A nice project to make a ski lift! 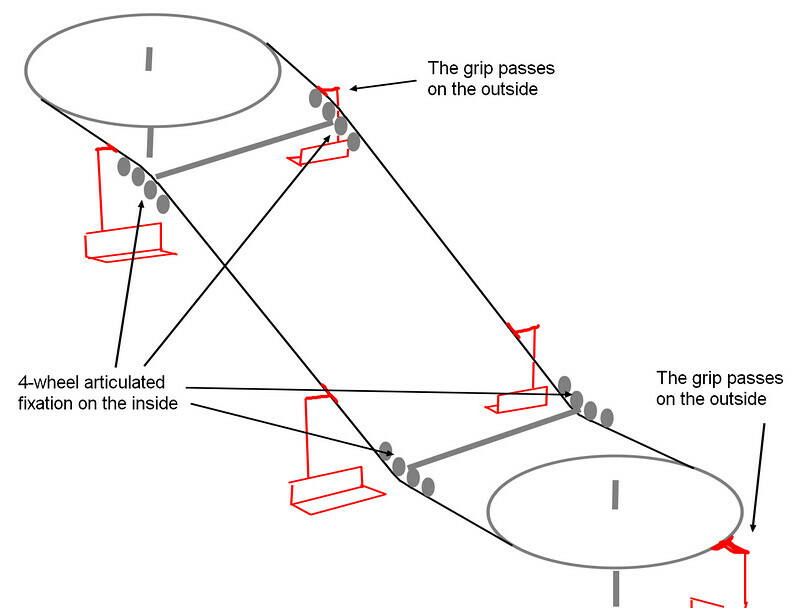 Possibly use two smooth tread motorbike wheels horizontally stacked to add grip onto the string in the center. Thanks. Makes sense. 4 of Part 88516 Tire 94.2mm D. x 22mm Motorcycle Racing Tread ordered. Hello. First at all, I'm not a Native English Speaker and this is a fairly technical discussion so I'm going to use a lot of pictures. Tension is the key in every ski lift so you have to deal with it. If you pay attention to the videos that you posted as examples they deal with this problem in very "convenient ways". 1. Your main towers collapse when tension is applied to the string. 2. The string slips around the plastic rim. I guess you are connecting the motor to one of those motorbike rims. Well, your towers seem very sturdy, so I assumed that when you say "collapse", you mean that they just "pop up" from the baseplate. If that is correct there are two things you can do to make them stay in place. 1. The obvious: Put more technic bricks that connect your tower to your baseplate. 2. 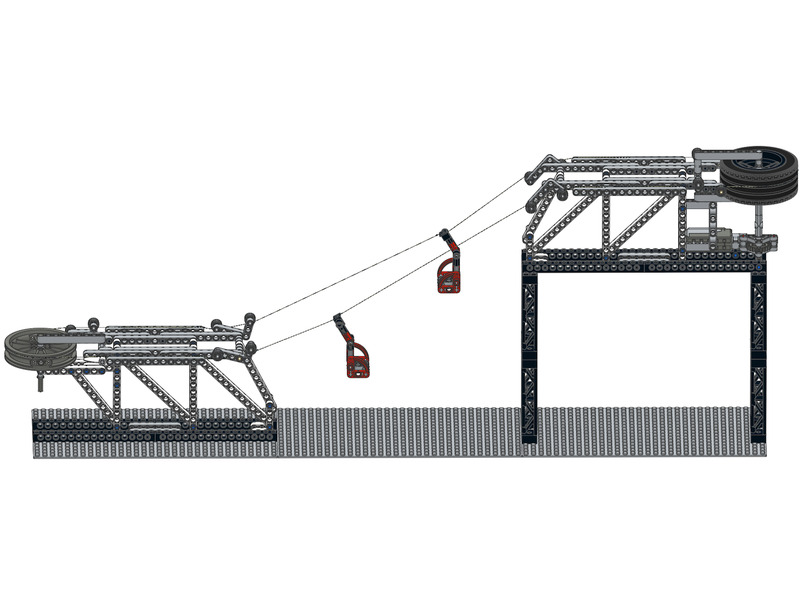 Relieve some of the horizontal tension by placing diagonal beams between your tower and the baseplate. According to the pythagorean theorem you can use a 21 diagonal when your base and height are 15x15. The longer the structure, the more resistance to tension. You can also place a secondary tower that helps to "support" some of the vertical component of the force. 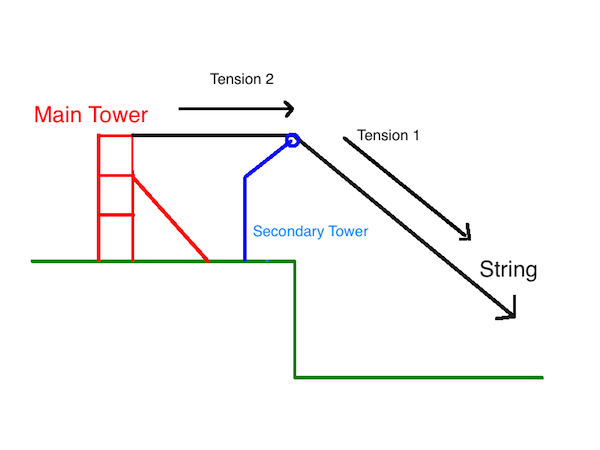 Tension 1 and Tension 2 are the same, but the Secondary Tower helps with the force "down to the ground" that the cables exerts due to the level difference between the two stations. HUGE DISCLAIMER: I use Tension and Force like they are synonyms, they are not, but it helps to explain what's going on here. Now, About the string. If you don't what the string to slip, don't change the string, change the wheel. Note that in the videos they use tires, which are made from rubber. Rubber coefficient of friction is a much greater that the coefficient of plastic. You may want to use two wheels one above the other to keep the string in place. Again, I assumed you are connecting the motor to one of those wheels. 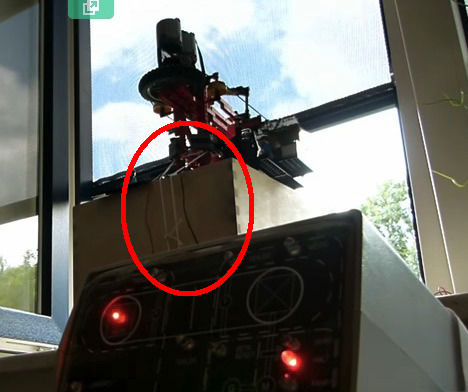 There are other ways to transfer mechanical movement to the string but using a big horizontal wheel at the end is how many of the real Sky Lifts works. Wow! Thanks. I will try these suggestions. About the gearing down, Put a small gear on the motor and a larger gear to turn your bullwheels. Check Sariel's book about gearing down. Post some pics of your drive mechanism so we can help with it further. 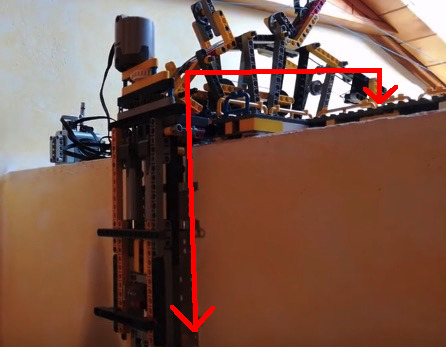 Check this out... http://curvetube.com/LEGO_Technic_detachable_gondola-Final_version_by_PG52_[HD]/9xm2VeHWkKQ.video PG52 is a great designer! I will try building some proof of concept models tonight to help you out. I haven't built a ski lift before, but I'll try! Wow! Thanks! I'm less overwhelmed and more excited. I ordered gears like that. I hope they come soon. About the problem you have with tightening the cable, you have the chance to work on a diorama on which you can attach things on. 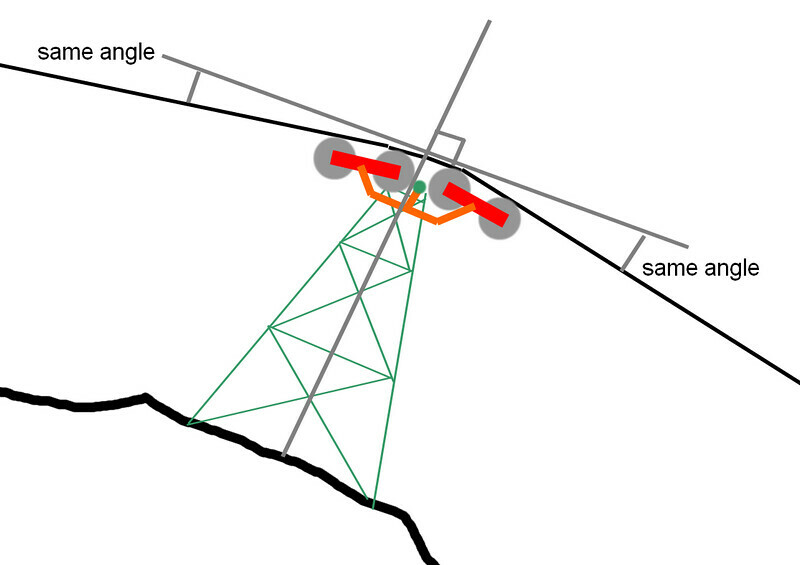 On such a small-sized lift, a solution could be to make a structure underneath the landscape which would link together both up and downhill station, and also the towers. That way, the only limit for tightening the cable would be the rigidity of the structure. About the towers, what you can do first is link together both sides of the top part of the tower (I think the right word is "shelves" or "schieves"... Can't find it) : basically, as you did, both sides can curve independantly but you can fix them on an axle that runs across the tower to get more rigidity. Then, using the following principle for mounting the towers can help : the more tightened the cable is, the more stable the tower will be. For this type of "support" tower, as soon as the ground is solid, you don't need any foundation for it. Fixing it using classic lego should work well. The more wheels you have one the towers, the more fluidly the grips will pass them, but the more alignment problems you may have. 4 wheels on each side is usually a good compromise ; 8 is useful if you have a big angle to make. You can also use 6 wheels, usually works well and not as big as the 8-wheels one but it is a little more complex (it's like a 8-wheel one where you replace one of the "4" by a "2"). The "grips" on the tire are big enough to guide the cable properly, it never slips, and it is also quite thin so no big aesthetic problem. I usually use 1 mm and 1.5 mm nylon string, which work really well with these wheels. Thanks. This looks great. I will post pix when my parts come! Thanks again! what is the BrickLink id number for that wheel and tire? This tire is actually important because the diameter and the “grips” are what keep the cable aligned. Also, this rubber has a greater coefficient of friction than the Lego motorcycle tyres. This is basically a standard rim. Full inventory and instructions will be available in a couple of days on rebrickable.com I recommended this site, it’s very useful for Lego builders. You are welcome. I enjoyed building this. A little more complicated than I initially thought. It was fun, though. I finished the video and the instructions. Some Information: I used a string that is a little bit elastic. There are two types of knots that I tried for securing the chairs. Both perform different and if you are interested in building this, you may want to try both and see which one suits your setup best. I don't recommend to tight the string too much, but I think that depends on the kind of string you are using. I guess you'll have to experiment. BTW, this ski lift can be mounted on a flat surface, too. 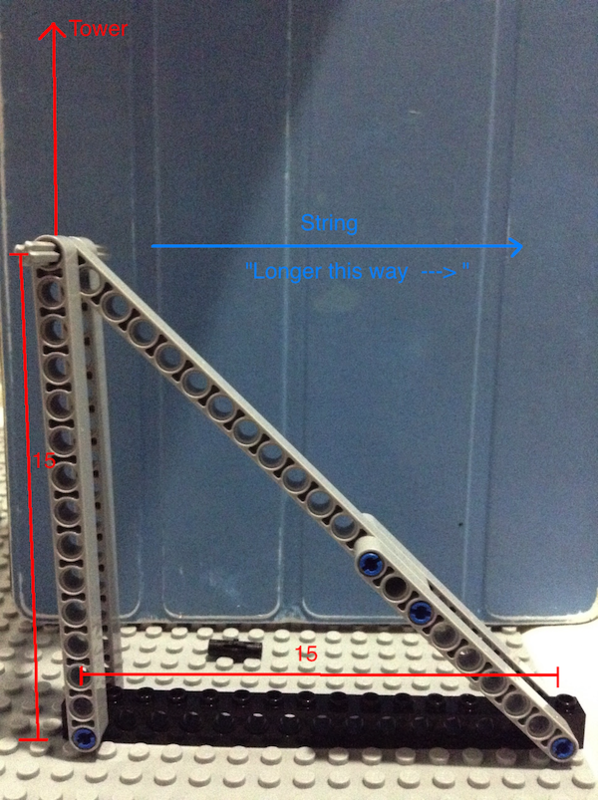 There are instructions for both assemblies: Flat and inclined ground. That's all for now. I hope you enjoy this moc. I may try to build something bigger and fancier. I have tomorrow off and will be trying to get this mostly built with what I have. I hope I have ordered correct parts and will get it running when they come. Thank you for you smart brain and hard work! 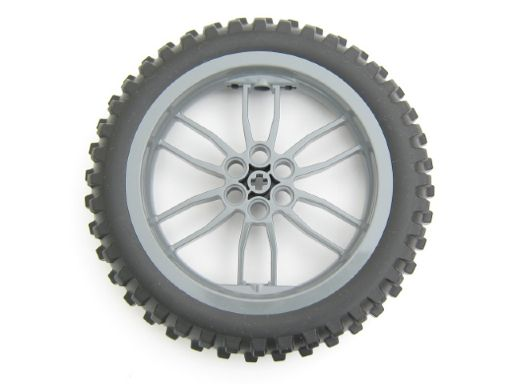 I got the right rim but the wrong tire so I have reordered on bricklink. The wrong tire will drive the string but pops off as soon as it has a load. It looks like it will work perfectly when I have he right tire. Did you get your ski lift finished? Wondering how you are doing? My son, his wife, and their 3 year old twins came to stay with us for 3 weeks prior to moving to Europe. They slept in my Lego room so I haven't done anything except cover it with a sheet. The only Lego I have done is Advent calendars with them and take them to Phoenix Lego Discovery. We had a blast there. They just left yesterday for Luxembourg. I hope to time my visit to them for a big Lego show. The ski lift is working beautifully but it is not tall enough. The minifig skiers smack into the trees. On my day off next week I plan to built a tecnic truss base and hide that with snow mountain. I hope to post pix soon. Thanks to dagupa, PG52, 1963maniac and TechnicRCRacer for your help. Can’t wait to see it! I have always wanted to build an amusement park style ride, but every time I try it ends up way too big. I hope to see some pictures. Did you change the color scheme to fit your village? it was quite a challenge but in the end it all came together pretty nicely.